concerns, among which toxicity is invoked as a rallying cry of the au courant. Included are artists from as far afield as New York and New Jersey, Florida and Iowa. for something to sink your teeth into..
arcane text of the night. 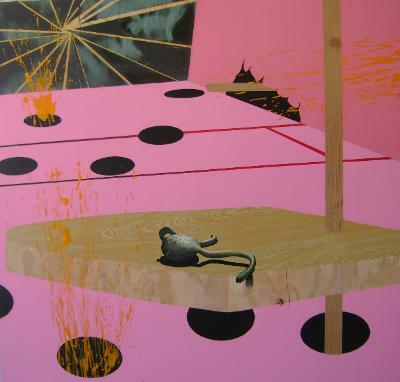 presents a predominately pink interior scene punctuated by round black holes. engagement with the ambiguities of decorative materials and motifs. “poisonous” color choices, an easy-to-appreciate beauty. Some of the most painterly images on view in this show are in fact photographs. slightly sickly, sticky sweetness of something makes it an unusually effective work. the blood barrier of visual apprehension, shooting directly into the brain.